Matt Chambers is an intense former lawyer from Louisiana. His company in Alabama is building the most beautiful motorcycles in the world, literally one at a time. You probably can’t afford one. We can't, either, but we can damn sure stand back and admire. Matt Chambers is a romantic. A graying, tousle-haired, Camus-quoting, artisanal manufacturing romantic who quit his career as a lawyer to build dream motorcycles. Instead, he drives a fun, fast, and frugal Ford Fiesta ST, which is a surprisingly rational, unromantic choice. Despite the automotive analogies, Chambers’ business is two-wheeled machines, not four. The motorcycles he builds in Birmingham, Ala., attract worldwide acclaim, with open admiration from designers. Ralph Lauren has used Confederate cycles to adorn the windows of his company’s flagship New York clothing store. Neiman Marcus featured one in that exclusive store’s Christmas catalog. Professionals who specialize in being seen in the right places with the right people have also adopted Confederates as props for promoting themselves, so watch for Brad Pitt, Tom Cruise, David Beckham, Tim McGraw, Bruce Springsteen and Steven Tyler aboard their fashionable rides. Unlike products that are damned by the faint praise of the qualifier “Southern,” which seems an apology for being less than world-class (“best opera company in the South,” anyone? ), Confederate’s motorcycles are global leaders in design, appreciated and respected for their mechanistic style and unparalleled craftsmanship. Even General Motors invited Chambers to speak at its design center, in a bid to grasp Confederate’s steampunk cool. The first-generation Wraith, a model that will be superseded by a replacement arriving this summer. It wears unconventional girder forks rather than the more typical telescopic forks seen on the Hellcat. “I feel Confederate has been at the forefront of the high-end bespoke motorcycle trend,” says Mazda’s U.S. design director, Derek Jenkins. Jenkins’ personal Southern California-influenced tastes lean toward similarly stripped-down, bare-bones designs, such as his own custom Meyers Manx-style dune buggy. “[Confederate’s] overall design aesthetic, careful use of materials and of course incredible craftsmanship has made them a true original,” he says. Jenkins’ Volkswagen Beetle-derived dune buggy is distant kin to the Corvair Chambers admires, so it is easy to suppose the two men share some of their design philosophy. Squint at the Corvair if you want an idea of Confederate's styling goals. “Intimidating” would surely be an accurate assessment, though “badass” seems to be the more popular description. It is with perhaps some irony, then, that these style leaders work in a low brick building that is literally nondescript; its front is unadorned with any signage or indication of the two-wheeled treasures inside. A cab driver was astonished to discover the business existed in downtown Birmingham. That is partially due to Confederate’s exclusivity. The company has three distinct model lines, each with its own specific flavor and pricing. The Fighter and the Wraith are currently on hiatus, due to emerge with fresh editions in 2015. The Hellcat is the sole model currently in production. At $65,000, it is the company’s entry-level model and has sold more than half its run of 60 machines. The upcoming models will top $100,000 in price, while the new Fighter P51 will see engine changes that boost power output to more than 200 horsepower. “I'm super excited by the new Fighter,” Chambers says. Confederate uses a computer-controlled milling machine to carve its engine cases from blocks of solid aluminum, like Michelangelo carving the David from marble, over and over again. By comparison, all other cast-block engines, even Rolls-Royce’s and Ferrari’s, are more akin to the cast models of the David sold in the Louvre gift shop. This technique not only creates tremendously strong parts, it lends them a unique design flair unmatched by traditional cast aluminum components. “The extensive use of geometric [computer-machined] elements throughout the bike create a great form and function balance that is both bold and yet authentic at the same time,” Jenkins notes. That theme is showcased through the use of a clear Plexiglas engine side cover that leaves some of the engine’s internal parts exposed to view, in the manner of a Maurice Lacroix mechanical watch with an exhibition case that exposes the movement inside for proper appreciation. A new technique for the upcoming Fighter will also whittle some additional mass from the engine case to help make the bike even speedier. Confederate’s goal is for its employees to embrace their jobs as an integral part of their lives. Workers should think, “I like the way my life looks inside that company, doing those things I do,” Chambers explains. The incredible precision machining applied to these engines makes them look more like Swiss watches than American motorcycle engines. There may be a parallel for Confederate in the beer industry. The Wall Street Journal reports that sales for behemoth beer brands like Budweiser and Miller Light are tanking, punished by the rise of craft beers like Samuel Adams, Sierra Nevada and New Belgium, whose Fat Tire Ale drove the company to 60 percent sales growth over the last five years. “The microbrewery thing gives me hope” that Confederate can thrive, Chambers says. However, he doesn’t view Harley as a Goliath to be toppled, but rather a fellow rebel spirit writ large. “Harley is the great rebel company,” he says. The Hellcat in action and at rest. If Harley-Davidson is Johnny Cash’s “Ring of Fire,” then Confederate is Social Distortion’s take on that song. All sharpened edges, glistening in the light. Just look at the Hellcat’s license-plate bracket. Where other motorcycle manufacturers make do with a cheap piece of stamped sheet metal or injection-molded plastic to secure the license plate, the Hellcat’s license plate mounts to a military-specification-looking piece of science-fiction fetishist’s fantasy. So much is perfectly executed on the Hellcat that it leaves the customizer at a loss for ways to personalize or improve it. The LED headlight assembly’s die-cast aluminum base could be polished. And, um, that’s about it. Confederate motorcycles are all new, but the company shares an ethos of hand-crafting machinery from the finest available components with automotive companies such as ICON and Singer Vehicle Design, companies which build classic vehicles into new machines that look like old ones. ICON works with first-generation Ford Broncos and Toyota Land Cruisers, while Singer specializes in Porsche 911s. Both of those companies celebrate the design genius of their chosen canvases, but Confederate creates its own, from scratch. Confederate’s name causes no small amount of befuddlement, which increases in proportion to distance from Birmingham. Chambers says the name is a tribute to the company’s Southern roots as well as to the design lines of the former Confederate Air Force vintage warplane collection in Texas. That group changed its name to the Commemorative Air Force to avoid unintended implications. But Chambers’ romantic notions of lower-case “rebel theory” by Albert Camus also contributed to the company’s name. He is excited by discussion of Pennsylvania’s 18th-century Whiskey Rebellion. What name could be more rebellious for a fan of pushing back against The Man? Confederate’s bikes are powered by big, loud V-twin engines, just like Harley-Davidson’s motorcycles. The engines are built by S&S Cycle, a company that specializes in making Harley-like engines and parts. S&S engines propelled thousands of Harley “clones” that were built in the ’90s up until The Motor Company (as Harley is known to bikers) boosted production to meet demand. The swell of middle-aged demand that resulted in the derisive term “investment biker” was sparked by the 1969 release of the film “Easy Rider,” Chambers believes. That movie made a deep impression on his generation, so when his cohort realized 20 years later that they’d made enough money to buy toys, that’s what they started doing, en masse. Chambers founded Confederate in 1991 in Baton Rouge, and his company could easily have been mistaken for another of those (now mostly defunct) Harley cloners. After an 18-month flirtation with San Francisco, Confederate returned home to Louisiana, but was ultimately chased to Birmingham by Hurricane Katrina. That gave the company a near-death experience in 2005. But while few clone makers survived Harley’s production increase, and Harley itself survived the credit crunch following the 2008 financial crisis only thanks to a government bailout, Confederate has weathered both financial and meteorological catastrophes. That’s because while it works in the medium of aluminum and steel, Confederate’s focus is on the art it creates from those materials. “It is really a design company,” notes Chambers. Manufacturers like BMW and Porsche operate design studios that not only design their vehicular products, but also do commissioned design work for other clients, which considering Confederate’s high esteem in the design community seems like a natural way to diversify and expand. Porsche Design, for example, creates clothing, sunglasses and luggage, while BMW’s Designworks USA has done work for Microsoft and Starbucks. They even designed Team USA’s bobsled for the Sochi Olympics. But so far, admiration for Confederate’s work hasn’t translated into any outside design work. Incredibly, “no one has asked us to,” Chambers says. 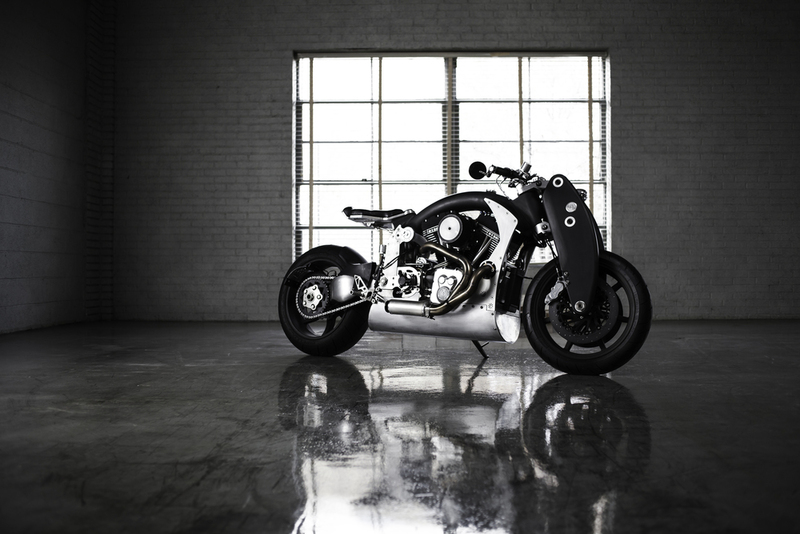 “It is a handmade motorcycle based on the tradition of a hot-rod, big-block American V-twin,” Chambers says. A tradition that, incidentally, is not exclusive to Harley-Davidson, as plenty of other motorcycle manufacturers have used the design over the years. As an art house, Confederate's production volumes are limited. Even Andy Warhol’s studio, “The Factory,” which employed artists to turn out handmade artistic creations in volume, was still not a printing press, churning out mass-produced posters. So while Confederate has discrete models it builds in series, rather than single custom one-off bikes built to customers’ specifications, the company isn’t equipped to produce in high volume. Aside from the inherent limitation of having each bike assembled by a single craftsman, Chambers’ outlook precludes a move to mass production. Still, some scale would be OK, Chambers admits. Just maybe not on his watch. He has his eye on the exit, so what he’d like is to put the company on a trajectory to achieve higher volumes, without overseeing it himself. Reaching annual sales that are 1 percent of Harley’s sales would be good, Chambers muses. That would be on the order of 2,500 bikes, but Chambers reckons he could see Confederate building as many as 900 bikes in a year with the company’s current production model of having a single craftsman assemble an entire motorcycle beginning to end. Carmakers’ specialty high-performance engine shops work in the same way, and Mercedes-Benz’s AMG division turns out about 25,000 each year, building just the engines using the single-worker approach. For Confederate to reach that point will require a bit more discovery of the brand by the wider culture, a moment Chambers is certain is nigh. “I just know we’re gonna come in here and there will be a thousand orders,” he declares. So if it is inevitable that some amoral Chinese factory will start building machines that vaguely resemble Confederates from 20 paces, the way they knock off Land Rovers today, well, that doesn’t motivate Chambers to try to beat them to the high-volume punch. Instead, he aims to prepare Confederate for the next generation of leadership by 2018. “I want to make sure the company is on solid ground in terms of product strategy,” he said. Today that means he’s focused on the company’s upcoming Fighter and Wraith models. “They will be the most badass American motorcycles ever!” he proclaims. The Wraith will test new heights for custom bike price and exclusivity, topping $100,000, according to Chambers. The planned P51 Fighter (there’s that nexus with the Commemorative Air Force again) on the other hand will be a smaller, lighter bike that employs new weight-saving techniques to be more a sport bike than a boulevard-pounding heavyweight. Regardless of the niche, Confederate has a single goal. “We try to peg the desire meter,” Chambers says. Fellow romantics worldwide appreciate the results.